This pumpkin pie granola is a million times better than actual pumpkin pie. It packs all the delicious flavors of pumpkin pie without that baby food texture. Carrie over at Carrie’s Sweet Life hosted this month’s What’s Baking challenge and the theme was pumpkin or squash. This granola recipe is crazy easy and since the pumpkin craze is in full swing, you probably have all the ingredients you need to make this in your kitchen already. I skipped out on using added fats in this recipe and instead used pumpkin to bind everything together to make a delicious, crunchy, slightly healthier granola. Preheat oven to 325°F. Line a large baking sheet with parchment paper and set aside. In a large bowl, mix together oats, pumpkin pie spice, cinnamon, nutmeg, and salt. Set aside. In another large bowl, mix together brown sugar, pumpkin puree, maple syrup, and vanilla until well combined. Pour the wet mixture into the oat mixture and stir until everything is evenly coated. Stir in pepitas and pecans. 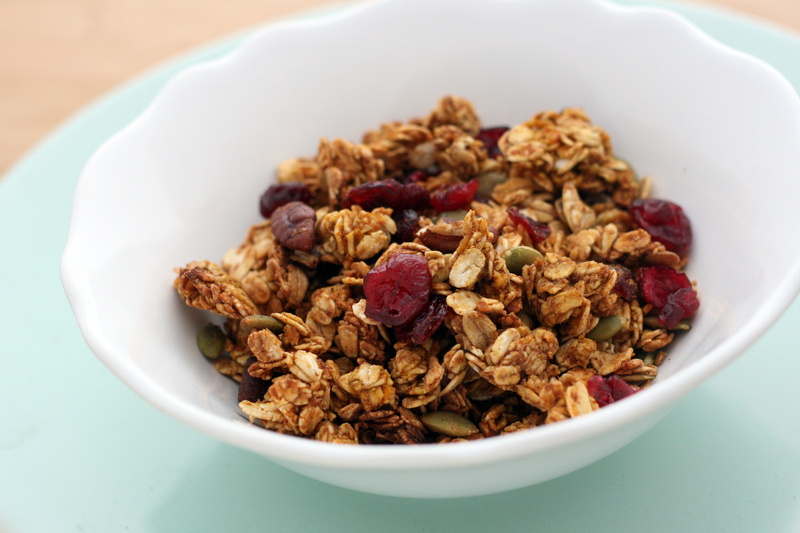 Place granola onto prepared baking sheet. Bake in preheated oven for 30 minutes or until golden brown, stirring halfway through. Remove and sprinkle cranberries on top and stir in. Let granola cool complete; it will crisp as it cools. Categories: Appetizers & Snacks, Breakfast & Brunch, Dairy Free, Food, Gluten Free, Money Matters, Quick & Easy, Special Diets, Vegetarian & Vegan | Tags: breakfast, brunch, dairy free, gluten free, quick and easy, snack, special diet, vegan, vegetarian | Permalink. It’s done. 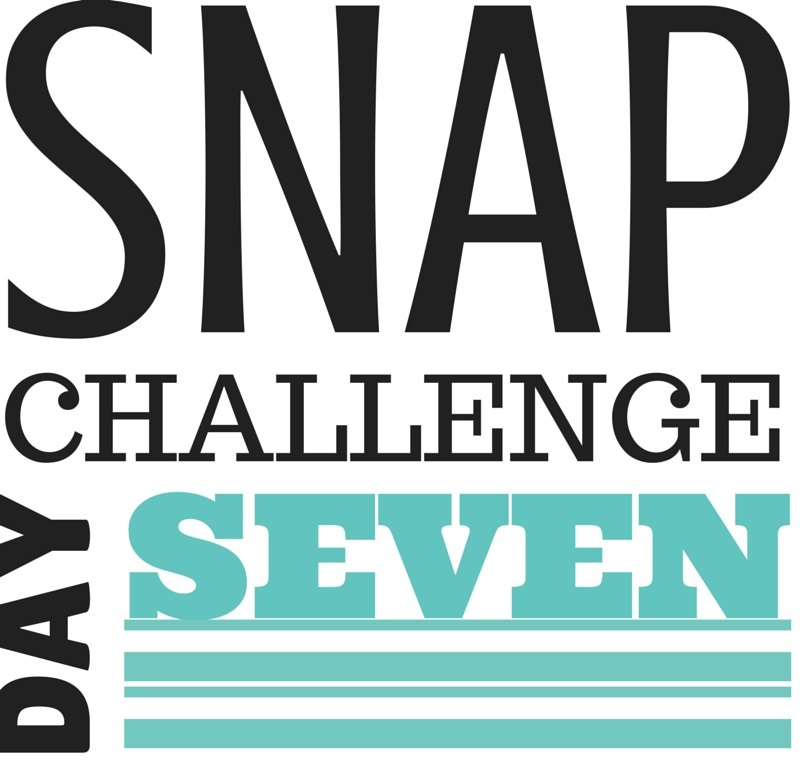 Mike and I have finished the SNAP Challenge. We both agreed that this year was harder than last. We couldn’t figure out why at first – we had plenty of food (leftovers, even), but everything just seemed more difficult. We think it was partially due to the fact that we had to complete most of the SNAP Challenge apart. I also didn’t plan for enough snack foods throughout the week. Doing this Challenge will never equate to what those who live on SNAP experience day-to-day, but this Challenge is always a great reminder of how much I have to be thankful for in life, and why I am never ever “too busy” to take time to volunteer. It reminds me to not judge people and the food choices they make. As a dietitian, my heart crumbles a little every time patrons at the food pantry choose 6 Slim Jim sticks over 4 cans of tuna. As a human, I now understand why they would make that choice. Bring a large pot of water to a boil. Cook pasta according to package directions. Reserve 1/4 cup of pasta water and set aside. Drain pasta and set aside. 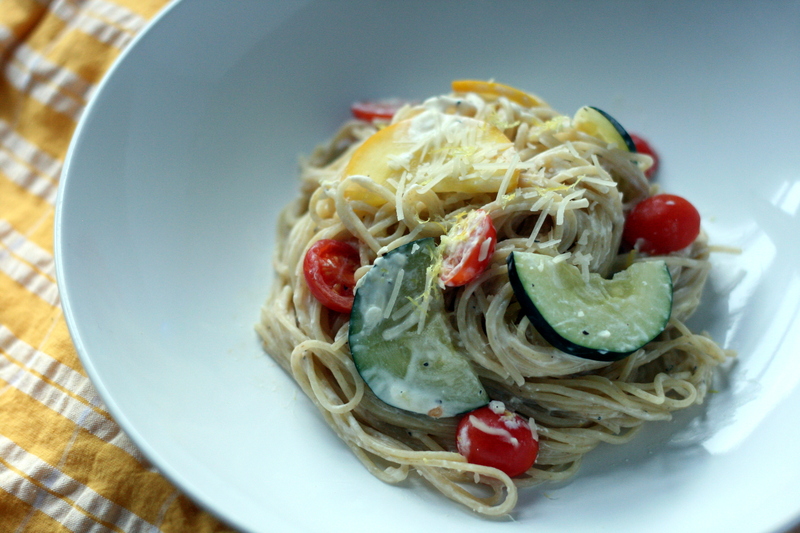 In a large bowl, whisk together yogurt, Parmesan, lemon zest, lemon juice, salt, and pepper. Set aside. Heat a large pan over medium-high heat. Spray with olive oil. Add garlic and cook for 2 minutes. Add zucchini and cook, stirring occasionally, until just wilted. Stir in tomatoes and cook until softened, about 2 minutes. Transfer zucchini mixture into large bowl of yogurt mixture and stir to combine. Add the drained pasta and gently toss until well combined. Add the reserved pasta water 1 tablespoon at a time, as needed, to thin the sauce. Serve immediately. Categories: Food, Main Entrees, Meatless, Money Matters, Pasta, Quick & Easy, SNAP Challenge, Special Diets, Vegetarian & Vegan | Tags: main dish, main entree, money matters, pasta, quick and easy, SNAP Challenge, special diet, vegetables, vegetarian | Permalink. 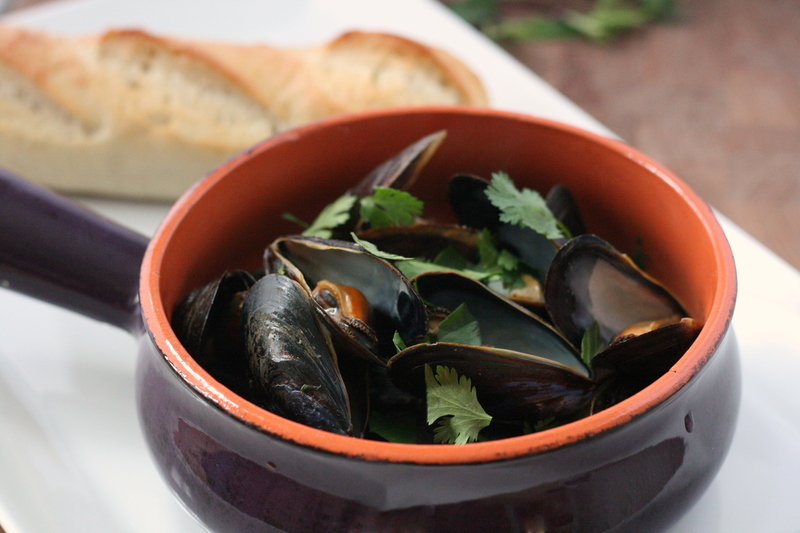 I still remember when I made this dish – I had invited my mom over for dinner after she found out I was making mussels. I figured that since she fed them to us a couple weeks ago, it was my turn to host. She declined since they had some guests. Turns out, I am dang happy that she didn’t end up coming over (does that make me a bad daughter?). Mike and I devoured this entire dish by ourselves and were wishing we had more. We couldn’t get enough of how flavorful the curry ale sauce was. Seriously out of this world. Next time, I’m going to whip up a triple batch and force my mom to join us. Heat the oil in a large saucepan over medium heat. Add curry paste, garlic, ginger, and lemongrass and cook, stirring frequently, for 2 minutes or until fragrant. Add the Shaoxing wine, coconut milk, soy sauce, fish sauce and basil leaves. Reduce to a simmer and cook for 15 minutes. Strain the sauce into a bowl; discard the solids. Rinse the saucepan out and then bring the ale to a boil over high heat. Add the mussels, cover and cook for 5 minutes. 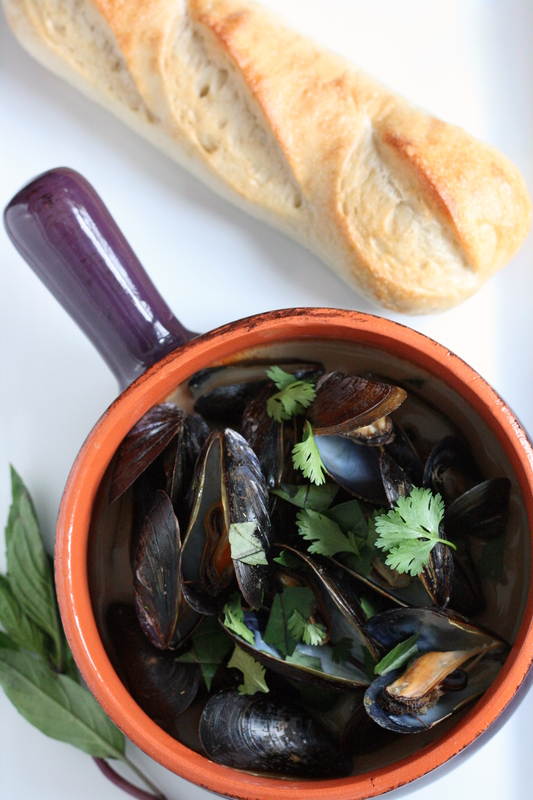 Using a slotted spoon, transfer the mussels to four bowls, discarding any that are not open. Add the red curry sauce to the ale and bring to a boil. Let cook for 1 minute and spoon over the mussels. Sprinkle with the remaining chopped Thai basil and cilantro and serve. Categories: Cooking with Alcohol, Dairy Free, Main Entrees, Meat, Quick & Easy, Seafood, Special Diets | Tags: cooking with alcohol, dairy free, main dish, mussels, quick and easy, seafood, special diet | Permalink. 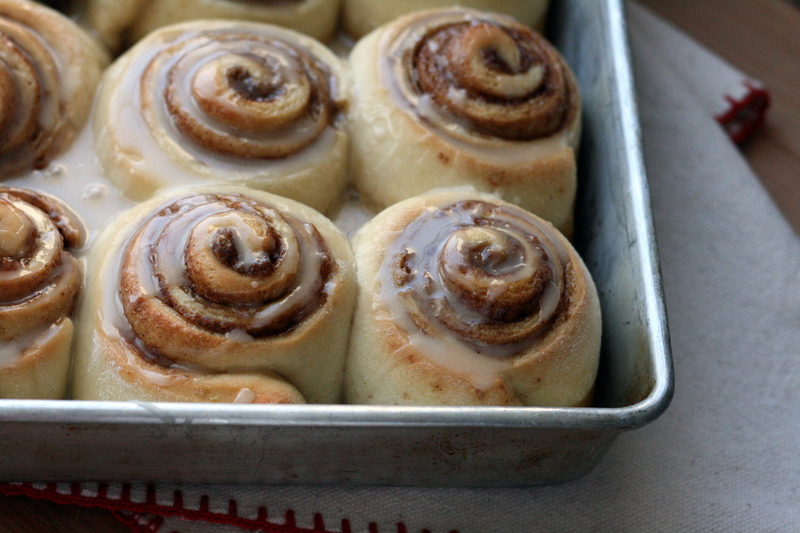 I wish I could sleep in a bed of these cinnamon rolls – warm, fluffy, gooey deliciousness. I swoon a little every time I walk past a bakery and smell cinnamon rolls baking away. And then I cry a little because I can’t eat the dairy-laden treats. So here’s my solution to my cinnamon roll problem. This isn’t a quick recipe, but the recipe is simple and the results are so worth it. I need to make a mental note to always make a double batch of these bad boys because they freeze beautifully. I let them cool and then individually wrap them in plastic wrap and store them in freezer bags. Then when I’m craving some cinnamony goodness for breakfast (or for a snack), I just pull one out and microwave it for a minute and ::bam!! :: (Almost) freshly baked cinnamon rolls. Heat milk in a small saucepan over low heat. Add in margarine and vanilla and stir until melted. Remove from heat and allow to cool. Meanwhile, combine yeast with warm water in a small bowl. Let sit for 10 minutes or until mixture is foamy. In the bowl of a stand mixer fitted with a dough hook or in a large mixing bowl, combine 2 1/4 cups of the flour, sugar, and salt. Whisk egg into the milk mixture until well combined. Pour milk and yeast mixture into the dry ingredients and mix until dough forms a sticky ball. Add in remaining flour 1/4 cup at a time, kneading well after each addition, until dough turns smooth and soft but still slightly sticky. The amount of flour you use will vary, but I usually use about 3 1/4 cups. Lightly oil a large bowl. Form dough into a ball and place in bowl, turning to coat in oil. Cover and let rise in a warm place for 45 minutes. Lightly grease a large baking pan. A 9×13-inch pan works well, or a large pie or cake pan. Punch dough down and turn onto a lightly floured surface. Cover with plastic wrap and let sit for 10 minutes. Roll dough out into a 20×13-inch rectangle. Spread melted margarine evenly over the dough. Whisk together brown sugar, granulated sugar, and cinnamon. Sprinkle cinnamon sugar mixture onto dough, making sure to get it all the way to the edges. With the long end facing you, roll dough up evenly. Gently pinch the edge to seal. With the seam-side down, cut the dough in half. Cut each half into 6 equal pieces for a total of 12 cinnamon rolls. Place rolls cut-side down in prepared baking dish, making sure to leave a little space between the rolls to allow them room to expand. Cover with plastic wrap and let rise for 45 minutes. Preheat oven to 350°F. Remove plastic wrap and bake cinnamon rolls for 25 – 30 minutes, or until lightly browned. 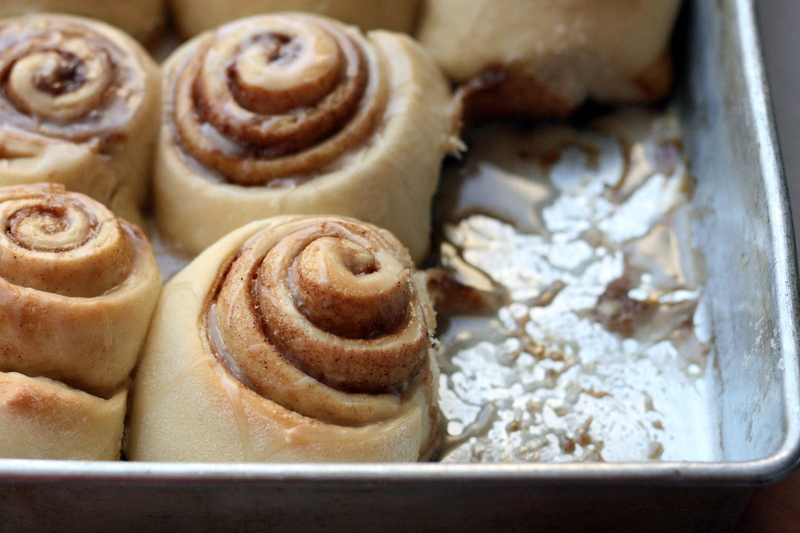 Allow cinnamon rolls to cool slightly in the pan to soak up the cinnamon sugar before icing them. Whisk together powdered sugar, almond milk, and vanilla extract until smooth. Drizzle over slightly cooled cinnamon rolls. Categories: Bread, Muffins & Rolls, Breakfast & Brunch, Dairy Free, Dessert, Special Diets | Tags: bread, breakfast, brunch, dairy free, dessert, special diet | Permalink. Last week, my PCP suggested that I go 100% dairy free instead of just lactose-free. I’m happy to say that I made it through my first dairy-free holiday and business trip. My plates were a bit emptier this year, but I’m thankful for the food that I was able to eat. I got turkey and gravy thanks to my father-in-law, stuffing and kale thanks to my mom, and dessert thanks to me! I’ve just come back from a four day business trip in a small town. I love traveling for work, but being dairy-free definitely has its challenges when eating out. I’m blessed to live in Madison, a city that has a plethora of restaurants that can cater to special diets. Appleton has fewer restaurants. These little towns I’m staying in for work? Nothing. I’m relying on plain salads or, if I’m feeling adventurous, a plain chicken sandwich on a bun with some guacamole. After all, there’s only so much Subway a girl can eat! Even after all this, I end up getting “dairy-ed” once in a while. Not surprisingly, I’m more reluctant to eat out and to even eat food that family and friends cook. I’m obsessively label-reading now and I’m doing my best to bring my safe foods with me so that I’m always guaranteed one thing to eat. My current favorite? 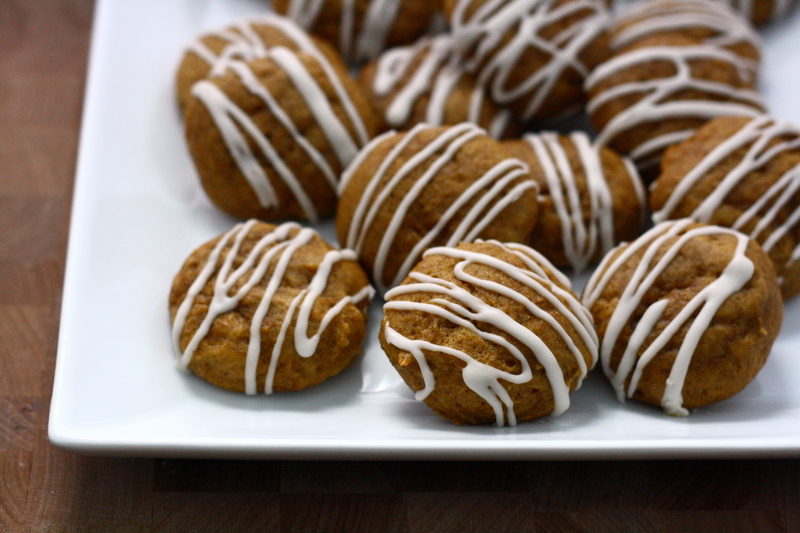 These iced pumpkin cookies. They are ridiculous. I made a batch for Thanksgiving and they were inhaled by my family. I made a second batch a couple days later and ate all the cookies within a matter of days (with a little help from Mike). I plan on making some more this weekend. There’s no such thing as too many cookies, right? Preheat oven to 350°F. Line baking sheets with parchment paper and set aside. In a medium bowl, whisk together flour, baking powder, baking soda, cinnamon, nutmeg, and cloves. Set aside. In the bowl of a stand mixer or in a large bowl with a hand-held mixer, cream together butter, white sugar, and brown sugar until fluffy. Mix in pumpkin, egg and vanilla until smooth. Mix in dry ingredients until combined. Wet hands and roll dough into 1-inch balls. Dough will be very sticky. Place dough 2 inches apart on prepared baking sheets. Flatten dough slightly with the palm of your hand. Bake for 15 minutes, rotating the baking sheets halfway through. Allow cookies to cool for 5 minutes on baking sheet before moving to a cooling rack to cool completely. To make the icing: Place sugar, 2 tablespoons almond milk, melted butter, and vanilla in a small bowl and whisk until smooth. Add additional almond milk as needed to reach desired consistency. 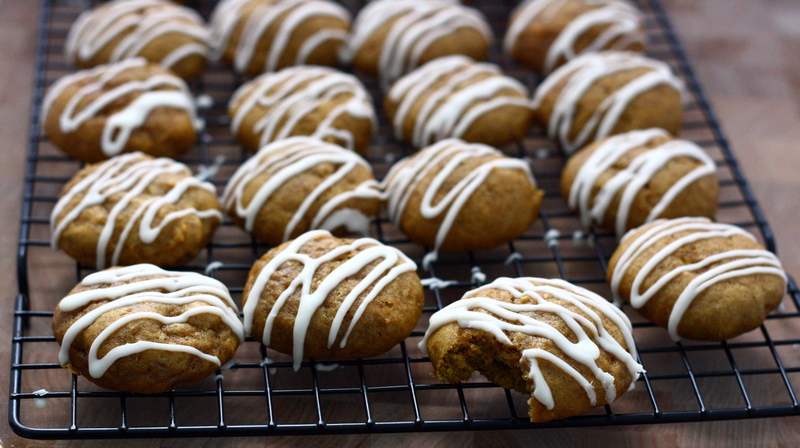 Drizzle cooled cookies with icing. Storage tip: these cookies get really soft when stored in a covered container. I suggest placing them on a plate and lightly covering it with plastic wrap, not covering the cookies at all, or eating all the cookies in one sitting. Categories: Cookies, Dairy Free, Dessert, Special Diets | Tags: cookies, dairy free, dessert, special diet | Permalink.